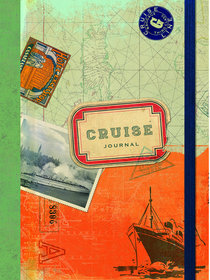 Going on a cruise is a luxury that deserves to be remembered in a luxurious journal. Ellie Claire's lovely Cruise Journal with integrated Quiver pen holder, is an invaluable companion for cruise ship travelers whether they are new to the high seas or take a cruise annually. This elegant journal includes space for recording all the details of your trip, including space for daily port-of-call memories, special photos/ post cards, travel details, healthy travel tips while at sea, addresses of those you meet, and more. About "Journal: Cruise Travel Journal With Elastic Closure"